The Beneath Heat ‘Staple & Rail System’ has been developed to be used in combination with floor Insulation panels to provide a secure method of securing the pipes to the insulation layer below. 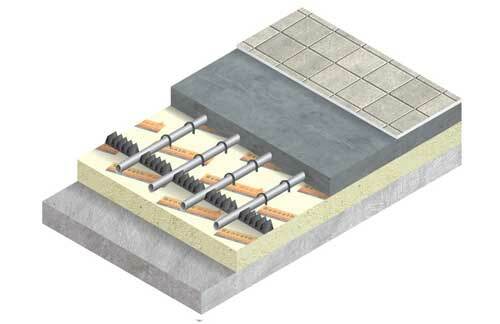 The Beneath Heat ‘Staple & Rail System’ is used for screeded floors. Insulation panels are laid coving the complete floor area. Rail is then laid at 1m centres across all areas which are to be heated. Beneath Heat pipework is then laid in accordance with the Beneath Heat design provided. Pipe is secured to the layers below with the rail in combination with staples.